The National Baseball Hall of Fame and Museum in Cooperstown, NY has more than 35,000 artifacts, 2.6 million library items (such as newspaper clippings and photos) and 130,000 baseball cards. Some of the most popular and heavily visited are those contributed by members of the 500 Home Run Club to mark their historic achievements. 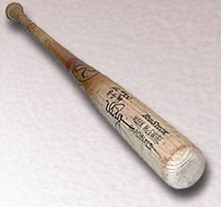 One of the latest 500 HRC additions to The Hall was added on April 8th 2003, when “Slammin’ Sammy Sosa donated the bat that he used to stroke his landmark 500th long ball to the HOF. Sosa, a Chicago fan favorite who used his power to delight the Wrigley Field faithful and millions of fans worldwide, became just the 18th player in MLB history – and the first Latin American player – to reach the milestone. • home plate from Milwaukee where he hit HR #s 64 & 65. The Museum also has the cap he wore in 1999 when he achieved his second 60-home run season and the jersey he wore on May 16, 2001, when he stroked his 400th home run, as well as the jersey worn by Sosa when he hit his #600th homer on June 20th 2007 against his former team the Chicago Cubs.